In scaffolding. A horizontal member used for fixing a scaffold to a wall or other part of a buildings structure to brace the scaffolding. The term derives from the medieval use of logs as scaffold members and the technique of leaving holes in the masonry or brickwork to "put logs" into for further scaffolding. These holes left in ancient masonry are a permanent reminder of how the scaffolding was constructed. The modern term refers to a section of tube that is attached to part of a building to help brace the scaffolding. 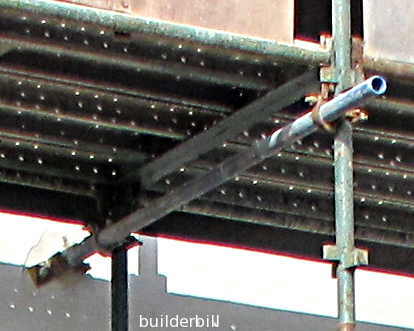 In the photo above the short length of tube is fixed to the scaffold standards with right angle couplers. It is fixed to the wall via a wall tie bracket and a masonry anchor. A surer method of tying into a wall is to use two or more putlogs through a window or around a column with tubes tying them into the wall or column.